I’ve trained a lot of people who come to me after they’ve experienced a home invasion. One such fellow is a billionaire from Texas who got in a shootout in his home with the intruder, and another is a woman from Virginia who was raped twice before she realized she ought to have a gun for home defense. And, just this weekend, I was teaching my Spy course in Las Vegas when one of the women who attended mentioned she had survived a home invasion. Obviously, there are few things worse than being violated in your own home, which is why I want to share with you the items and tools I currently have on my nightstand to help me stop a home invasion should some criminal try and break into my home. 1. First, the nightstand itself. I have the nightstand right next to my bed. The size of the top of the nightstand is about 24 inches by 18 inches. I believe I got this nightstand from a thrift store awhile back so there’s nothing fancy about it. 2. I have a humidifier on the nightstand. The only reason I tell you this is because I’ve been sick lately and in bed a lot, as I am right now. I am literally typing this from my bed and looking at my nightstand and I plan to share everything that is on it. 3. 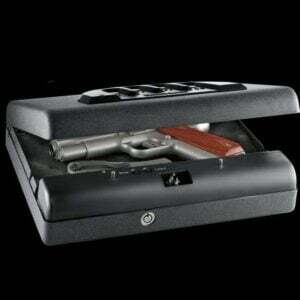 There is a Gunvault gun safe. The exact model I have is the Gunvault MV500-STD Microvault. 5. Also on the nightstand is a dedicated cell phone. It’s a pre-paid phone I picked up from Walmart. That phone is always there so I at least have one cell phone for an emergency call and if I add my regular cell phone to the top of the nightstand then I have a backup. 6. At this moment on my nightstand there are three flashlights. You should obviously have one light available at all times, but I like flashlights and they tend to congregate on top of my nightstand. The three flashlights I have on the stand are a Surefire 6PX Pro, a NexTorch TA1, and an Olight T10. All three of these flashlights have worked well for me and I don’t have any complaints about any of them. 7. I have a set of scriptures on my nightstand for religious reading before I go to bed each night. As you can see, there’s not a lot of clutter and nothing fancy. It’s a simple set up that gives me what I need in case my home alarm goes off in the middle of the night and I have to quickly access my gun to protect my family. If you’re not fully prepared to defend your family from a home invasion make sure and work on your own “nightstand setup” this week.